Miami – no pun intended – remains one of the hottest destinations in the USA. Its South Beach, SoBe for short, has often been called America’s Riviera and rightfully so. It has the glitz and glamor, the beauty and the beaches, the restaurants, the shops, the everything you’d want for either a decent or decadent holiday. And Miami is a city that knows how to party. Witness this past weekend’s South Beach Food and Wine Festival, which annually attracts a smorgasbord of celebs and celeb chefs. This year’s celebs included Rachael Ray, NBC’s Al Roker and the Travel Channel’s Andrew Zimmern. But after you tire of the glitz and glamor, the beaches, the shopping and the dining, what’s there to do? Quite a bit, in fact. And to set you off in the right direction here’s my personal smorgasbord of sights you should see in and around Miami. 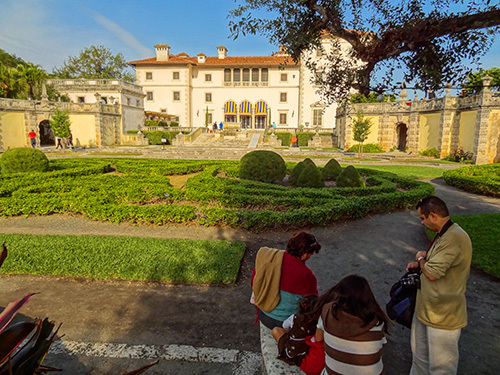 Vizcaya is one of the great gems of Miami although many tourists, as well as some of the locals, have never visited this magnificent historic residence, a 16th-century-style Italian estate on Biscayne Bay. Constructed by industrialist James Deering, the property is a blend of Renaissance and Neoclassical styles (due to changes made over the years) and contains many of the items Deering purchased on his shopping trips all over Europe. 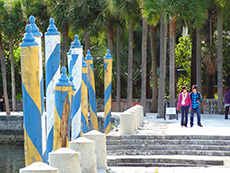 Striped poles along the shoreline of the bay evoke the beauty of Venice, while its beautiful formal gardens mix Italian and French features with the tropical foliage of Florida. If you see no other site in Miami during an afternoon away from the beach, this should be it. This small museum, just a short walk from the sands of SoBe, explores the connections between its historical collections and contemporary art. 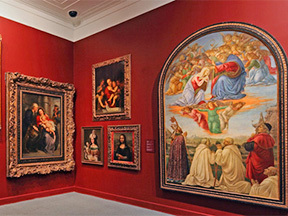 It has a good collection, which while not as extensive as many other museums, does include some wonderful pieces from the 15th-17th centuries including European paintings, textiles and sculpture containing some Renaissance pieces, and beautiful 16th-century Flemish tapestries. 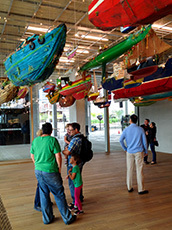 Its special exhibitions are usually quite interesting, as well. Another of South Florida’s unexpected treasures is the Venetian Pool in Coral Gables, a more staid community than raucous South Beach. If you don’t have a car don’t fret since it’s on the tour itinerary of the popular hop-on hop-off buses that wind their way through greater Miami. 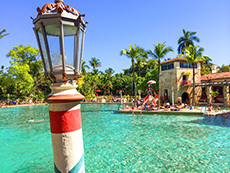 It’s an incredible place that melds the fantasies of Venice and Florida and has been labeled by one popular guidebook as “the most beautiful swimming pool in the world.” It’s also the only public pool in the U.S. listed on the National Register of Historic Places. 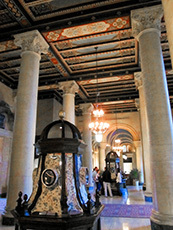 Another National Historic Landmark, and just a few blocks from the Venetian Pool, is the palatial Biltmore Hotel. Its lobby, rooms and restaurants are sumptuous but it’s also renowned for its stunning pool, the largest in the continental United States. It’s where Johnny Weissmuller set his first world record. Many celebs including Babe Ruth, Bobby Jones, the Duke and Duchess of Windsor and Al Capone have stayed at the Biltmore, as do many U.S. presidents when they visit Miami. Time your visit to have an afternoon snack and drink alongside the colonnaded pool. The newest kid on Miami’s cultural block, the Pérez is located on the Biscayne Bay waterfront across from the cruise-ship terminal. Designed by the award-winning architects who designed the Tate Modern in London, the de Young Museum in San Francisco and the Parrish Art Museum in Water Mill, NY, it’s a unique place that combines the view of the art inside with that of nature outside. Most notable and surprising to many are its lush columns of plants (each weighing almost two tons) that hang from the beams over the walkways outside. 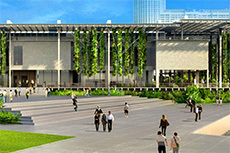 The museum focuses on multicultural art of the 20th and 21st centuries and merges the collections of the old Miami Art Museum with that of billionaire Jorge M. Pérez who funded part of the construction. Leave your bikini in your hotel room and take the 10-minute taxi ride from SoBe to see it. 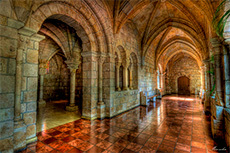 Now an Episcopal church, these cloisters are hidden away in North Miami a half-hour drive from SoBe. Many Miamians are shocked to find that such a place exists right on their doorstep. Part of a 12th-century Spanish Cistercian monastery, these cloisters were bought by millionaire William Randolph Hearst in 1925, who had the building totally disassembled stone by stone – 35,000 stones in all – and meticulously packed for shipment to America. But before they left Spain the boxes were opened and many of the stones were mixed up. Until the early 1950s, the boxes of rock were stored in New York City until some enterprising people decided to try to put the whole jigsaw puzzle back together again. Pay it a visit and you’ll also find some stones just lying about since to this very day no one can figure out just where they’re all supposed to go. A bit further afield (about an hour’s drive) from SoBe and downtown Miami, The Morikami Museum and Japanese Gardens are interesting places to visit. 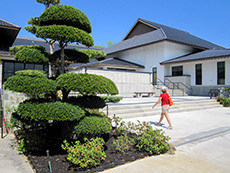 Located north of Boca Raton, it’s a center for Japanese arts and culture in South Florida. It was begun in the early 20th century by a group of Japanese farmers who came with the intention of revolutionizing agriculture in Florida. Then called the Yamato Colony, it fell short of its goals and all of the farmers except one ultimately left. That remaining farmer, George Sukeji Morikami, continued his work into his 80s, when he donated the land to the county. Today it is a wonderful small museum with beautiful Japanese gardens, bamboo groves, a bonsai collection, a rock garden and much more, including a fascinating exhibit of a Japanese home. The museum also has a small cafeteria, a great place to while away an afternoon having lunch or tea before walking around the complex.